Yelloh, guys! I just wanted to say I got a hamster this X-Mas Eve. And like I can't show a pic now coz I dnt rly know how to work it. xD But she's super cute and her fur is like light caramel-ish. Lawl. I've been having her for about...24 days...or so. And I named her Eve coz like Christmas Eve AND i cudnt think of anythin. So I'm gonna wait for probly bout a year coz my dads gonna buy a male so b4 my hammie dies, she'll produce some hamsters for me to have some more! lol. 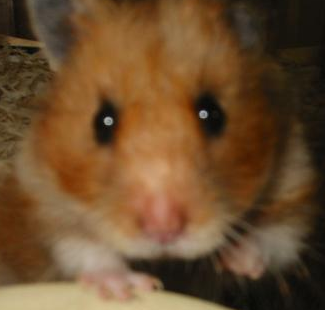 Also, my sis, Pokeranger, got a hamster, too. And well, she probly told u I guess. It's white with red eyes and it's name is Muki Rikoto. (i know, so japanese-ish, huh? xD) Yeah well, that's probly it.